Success Secrets for Kids Biking to School – A Win for Kids and a Win for Parents! Fall bike riding offers the chance to enjoy cooler temperatures, view the changing colors of the leaves, and reinvigorate your spirit with the freedom riding a bike inspires. What is true for adults is also true for kids! As the school season is underway, many children are coping with new daily routines which include more structure and less playtime. Riding a bike to school is a great way for kids to get exercise, develop healthy habits, as well as, enjoy some extra playtime. As many adults know, exercise helps reduce stress, aid with weight management and promote bone, muscle, and joint health. But what you may not know, is that riding a bike to school may also help your child’s academic performance. Bicycling to school can help contribute to the developmental health of children. Despite the benefits, some parents are left with concerns as to how to make bicycling to school a win – win. A win for their child in that they enjoy the experience and a win for the parents in that you have confidence your child arrives safely on their commute. Here’s what you need to know to make biking to school a success for both you and your child. Think about whether riding a bike to school makes sense for your child. If your child attends a neighborhood school biking may be a good option. If you child is at a charter school across town where she plays the double bass in the orchestra, biking to school may not work. Look at your child’s schedule and consider biking to school on days that are best. Talk with other parents and the principal to address real and perceived obstacles to getting kids on bikes. Dial in your child’s bike. Bring it into the shop for bike maintenance and ensure all bike parts are working properly. Make sure your child knows the rules of the road. Invest in needed items. Purchase a quality bike lock and teach your child how to use it wisely. Consider getting a quality pannier or messenger bag instead of a backpack. Also, be sure to have the appropriate cycling apparel for the season. 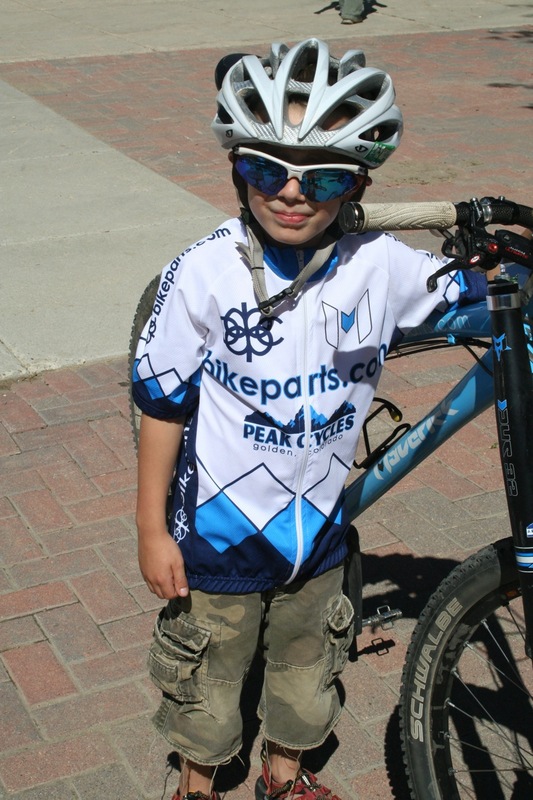 In fact, Peak Cycles Bicycle Shop is only store in Golden, CO that serves kids cycling needs. We have bike parts and cycling accessories that includes windbreakers, gloves, shorts, jersey’s, chamois, pedals, hats, backpacks, and bikes that kids love. Most importantly, we have reflective materials to put on your child’s bike to make sure they are visible. Stop by the shop or visit us online at www.BikeParts.com. We’re here to help you and your family make biking to school a win-win for all! This entry was posted on Thursday, October 1st, 2015 at 7:00 AM and is filed under Peak Cycles Bicycle Shop. You can follow any responses to this entry through the RSS 2.0 feed. You can leave a response, or trackback from your own site. One Response to Success Secrets for Kids Biking to School – A Win for Kids and a Win for Parents!